As the summers are on, it is important that we take care of our health all the more seriously. Though the season brings in a lot of fun, holidays and vacations, it’s also the time to get indoor and spend the whole day on the couch. It is not only that, we pay attention to our health, but it is also important that we stay active and moving in summers. We at Diet Clinic is making sure that this summer, you not only have all the fun and excitement, but also regain control of your health and weight. Don’t let the hot weather mellow down your motivation. 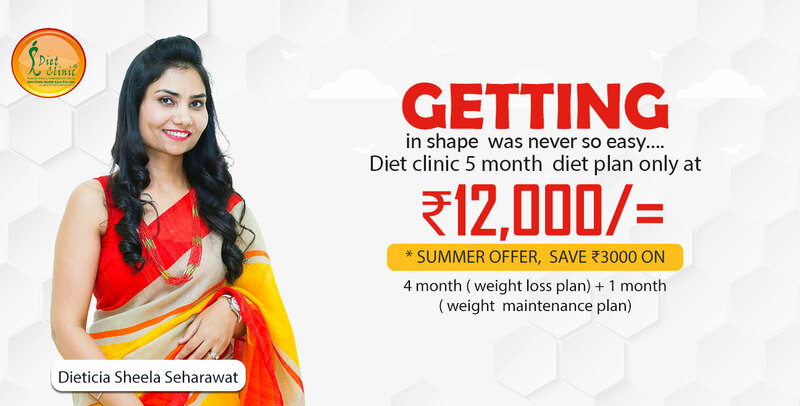 Stay healthy & get back in shape with Diet Clinic’s this season with our jaw dropping offer. Avail 5 months Weight Loss Plan only at Rs, 12,000/-. Get hot with our summer offer of Rs. 3000/- OFF on our 4 months (Weight Loss Plan) + 1 month (Weight Maintenance Plan) package and make healthy living your habit. As soon as you book the package and fill our registration form at the clinic or online, you will meet or get a call from a Dietician / Nutritionist. (Form will help us understanding your dietary, physical and medical activity, which you are required to fill). She will also ask you some basic questions about your lifestyle and discuss your medical history. However, this can also be done through telephonic conversation. This is a 30day long program, wherein the diet plans are meticulously planned as per the client need so every plan is unique and fresh. At one time, we give 3-4 days diet plan and you can expect to lose 1/2 to 1 kilo per week based upon your metabolism. Every week, we plan the diet after consulting you and considering your feedback. Overall, you can expect to lose 3-5 kg and a few inches in 30days time. 1) We will be giving/ sending 3-4 days of diet charts at a time. 2) We will be sending healthy and easy to prepare recipes too. (You can get it from our diets cookbook, or from our website).